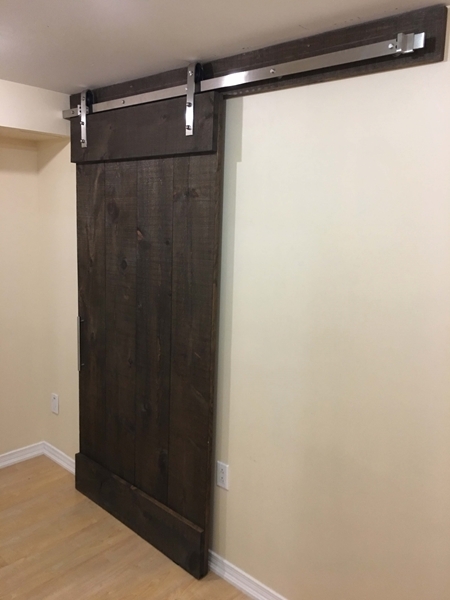 118" Track Stainless Steel (2 x 60" tracks + track joiner link) Bent Strap Wheel Barn Door Hardware Kit For Door Widths up to 60"
If you are hanging a solid barn door we recommend using a header board. This can simply be a pine plank that is 1 inch thick by 6 inches wide. You can paint the plank to match the walls or stain the plank to match the door. The lengths are as follows: When using a 78.75-inch track, use an 80-inch header board. When using a 98-inch track, use a 100-inch header board. When using a 118-inch track, use a 120-inch header board. If this barn door hardware kit is too large for your requirements, we offer a 98" hardware kit and a 78.75" hardware kit as well.